We reported a couple of days ago that Joan Rivers, 77, who has reputation of speaking her mind was very verbal about her feelings for Sarah Palin. 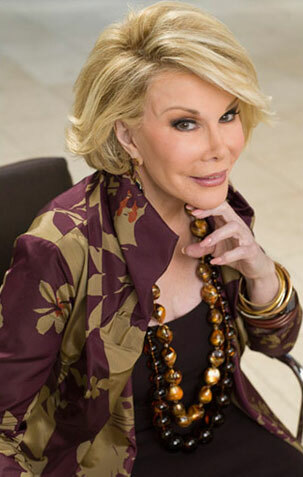 Joan is now claiming that her comments resulted in a scheduled appearance on FOX & Friends being cancelled. In her comments Joan said that Palin’s website encourages violence and that Palin is just stupid. Rivers was scheduled to appear with daughter Melissa tomorrow on the show to promote her new show, “Joan & Melissa: Joan Knows Best?” River’s rep tells us a producer called to say they gave her the chop because of Joan’s comments. Fox claims they overbooked the show and cancelled her by mistake. Why don’t I buy this? You may or may not agree with Joan’s comments – but she should have the right to make them without being made to pay a price.